When given the difficult appetizer choice between mozzarella sticks and Buffalo chicken, perhaps we can look to the wise young girl from the Old El Paso commercials of yore and say unto ourselves: "Why not both?" At least, that's the rationale behind Host the Toast's Morgan Eisenberg's newest recipe... for BUFFALO CHICKEN MOZZARELLA LOGS. Goodbye, indecision. 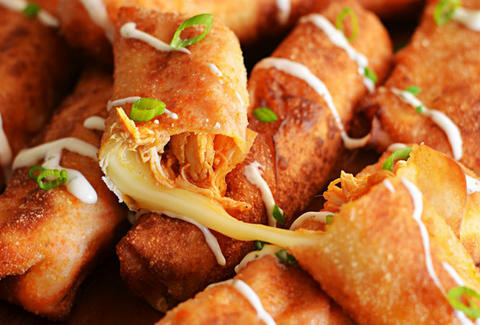 This ideal Super Bowl app is made by slow-cooking shredded chicken in Buffalo sauce, combining it with mozzarella cheese, wrapping everything up in egg rolls, and deep-frying to a golden brown. Of course, then you've got an even more daunting task ahead of you -- namely, deciding whether to serve them with blue cheese, ranch, or even more Buffalo sauce for dipping. But we think you can handle that one on your own. You can find the full recipe at Host the Toast, right here. Adam Lapetina is a Food/Drink staff writer for Thrillist, and wonders if you could combine these with nachos. Read his musings at @adamlapetina.